Am Ghobsmacht! : Jamie Bryson and the Northern Irish 'Serbs'. Jamie Bryson and the Northern Irish 'Serbs'. "С ВЕРОМ У БОГА ЗА КРАЉА И ОТАЏБИНУ"
I don't have a vendetta against Jamie Bryson or anything like that, but his bull-headed insistence on destroying Unionism by taking it through the Carsonian graveyard and digging up the bones of old dead Unionism to assemble a Unionist Frankenstein is quite frankly alarming me. And he's done it again. Well, rather I did first. I added his blog to my list and now the temptation to read it is just too much. His most recent contribution is by and large 'fine'. He's talking about the rights of independent Loyalists to put themselves forward to represent people. I do fear that it'll force the DUP further to the right, but, that remains to be seen so knock yourselves out. "The political views carried by those such as myself have recently been described as 'extreme' by those that wish to mould loyalism into a cuddly, re packaged brand that is more friendly and welcoming to those that are offended by every aspect of our cultural and religious identity..."
All the criticism leveled at Jamie might have been too in depth for him to absorb and I'm sure he's a busy chap, so, I'll keep this brief. I detect the Loyalist filter again. 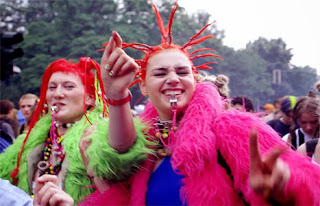 We say "less offensive" or "less songs/banners about killing people" and he hears "Berlin Love parade"
Is this the 12th with the drinking removed? Not likely. I highlighted before that (in theory) a Protestant can be a Republican. Though once common enough it is now very rare but still, it is possible. This is in stark contrast to Jamie's Loyalism which would not do anything to remove Loyalism's obstacles to Catholics: The Lanark Way bonfire, bands with paramilitary regalia, songs about killing Catholics etc. Even if they did remove them it's highly unlikely legions of Catholics would come knocking at the doors of Orange Halls to join bands. BUT, what harm would it do to level the playing field a bit? How can removing these elements result in a 'cuddly' creature that would destroy Unionism? Also, who are these people who are offended by EVERY aspect of Loyalist (or Unionist or Protestant culture)? From what I see most of the direct calls come from moderate Unionists NOT seasoned Republicans, they seemingly only stick their oar in whenever there is potential political capital. Indeed, why kill the goose that lays the golden eggs? If Loyalism's underbelly and sometimes vulgar displays make Unionism a cold house for Catholics then that makes life easier for those who would see Northern Ireland cease to exist. But what of the majority who just have SOME irks with Loyalism that could easily be addressed? Or does binary Loyalism not allow for the recognition of such middle ground? Methinks he's just hearing what he wants to hear. All could be clamped down upon with a bit of effort. The Loyalist band scene is more disciplined than what people give it credit for. But There is a lack of will. 'Leaders' like Jamie are loath to encourage such will as they either see nothing wrong with this behaviour (which would beg the question how much of the Holy Bible has he actually read?) or they're digging their heels in as they resent being told what to do. If that's the case then allow me to be the first to apologise. I'm sorry you think that you have no option but to dig your heels in under the pressure. I'm sorry if you think I'm talking down my nose at you from some aloof position that exists only in my arrogant mind. I'm sorry if I/we give the impression that we don't care for working class Loyalists. That's simply not true, but it's very hard to convince them of that. Some of us see things differently and are denounced as Lundies for our different views (you'd think a Martin Luther inspired religion could appreciate speaking out against drunkenness and ungodly behaviour?) so we have to apply pressure in order to be heard. The pressure isn't there to see the end of band culture. 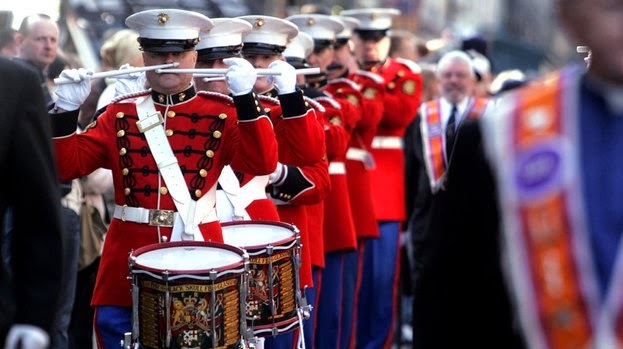 On the contrary, if any one is presenting the case for banning parades altogether it is the Orange Order and your mates like Wille Frazer and the camp at Twaddell. I'm/we're not asking you to change these things out of spite or for the sake of Getalongerism. I'm/We're asking you to help change these things because they are, when judged on their own, fundamentally wrong. Comparing them to the Provo's murder campaign might make them seem 'good' but that's a pretty low bar to compare one's behaviour to. I'm also asking you to do it because it's killing Unionism. 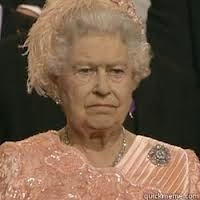 Our support in Britain shrinks evermore. People are embarrassed by 'our' actions. You aren't a fan of Sinn Fein. Yet you seem oblivious to the fact that every time Loyalists kick off it detracts from whatever 'Republicans' might be up to. The SpAd Bill was a red face for Sinn Fein and it happened only a few months ago, but since marching season kicked off it's now ancient history and SF have recovered from it. Loyalism, in theory, should be the bulwark against Republicanism. But the way you and other Loyalists are so predictably reactive and easy to manipulate means that time and time again Republican blunders are forgotten about and that Loyalists can be counted on to flair up when desired e.g. Richard Haass is on his way to town so Republicans organise a few parades and people like yourself go ape and then Mr Haass gets to see who the 'bad guys' are. Loyalist Monkey dance?! Who'd have thought?! 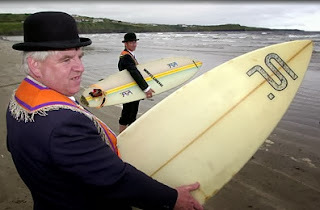 If you despise the 'cuddly' idea of Loyalism, then do the Orangemen at Rossnowlagh disgust you? 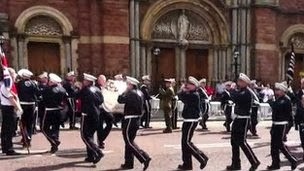 Do peaceful parades with no paramilitary trappings offend you? Does the idea of a Catholic voting for the Union and going to a Northern Ireland football game make you shiver in dread? If not, then what's your reason for not supporting some changes and a giving Loyalism a new lease of life? What of this Bible based morality that you wish to entwine with Loyalism? Surely drunken behaviour, murderous songs and disrespecting the law are incompatible with Christian teachings? Or do you intend to overlook those aspects? Times have changed and it's now no longer just Nationalists who are against Loyalism, people like you are turning Protestants and Unionists against Loyalism too. Defiant of international opinion and latterly their 'mainland' capital. It should be, for Jamie's rhetoric and visions are frighteningly similar to those of the Republic of the Serbian Krajina ("Krai-eena"). And like the Republic of the Serbian Krajina he's on the overtly nationalistic, flag-covered, defiant, truth-denying, partisan road to destruction. And he (with others) will potentially take Northern Ireland with him. Another great piece Am Ghobsmacht. As a working class 'prod' from North Belfast it's very frustrating to see a complete lack of intelligent leadership from the Loyalist community, the OO, or Unionist politicians. Are our Unionist leaders there solely for the hard-liners within Loyalism and the Order? These politicians are supposedly well educated experienced men but even I, with barely a couple of GCSE's in my back pocket, can see how they are all being led a merry dance. Their attitudes have to change. It's obvious to me that the protest camp, nightly parades or the threat of 'civil disobedience' will NOT get the OO up that road past Ardoyne. It just isn't going to happen without talking and acting responsibly. I feel the middle-class, fundamentalist leadership of the Orange Order is again trying to use the working class loyalist community to get what they want. With civil liberties come civil responsibilities. Time for the leadership to start showing responsibility . If they hold the rest of society to ransom then they will not easily be forgiven. They can't count on the unwavering support of the whole of the Protestant community any longer, A lot of people are getting pissed off at their embarrassing antics and they only risk alienating themselves further from the rest of society. The Union is safe, don't go messin' the whole thing up! Fantastic piece from the author and very interesting oppinion from yourself mate. I am a working class republican from north Antrim now living in west Belfast. I could not agree more with you there and it is refreshing to hear an opinion like such coming from a working class protestant. The republican leadership do exactly the same to our people the are getting a free ride with the inability of the unionist leadership and we, the working class people, are the ones who suffer. I personally hate religion especially in politics. I believe people should be allowed to have faith in whatever they wish but they should not try and enforce it in others lives. State and religion should be completely separate. I am a republican because I believe the idea of the republic is the best form of governance we can afford in the system we live in. I am a socialist because I believe the government should be by the people and for the people. For too long tribalism has held this island back, if only the working class could rise and take the power back. All over our island resources are being dug up and sold to foreign corporations and fattening the pockets of the politicians while they run around the globe trying to convince foreign companies to set up shop with call centres etc, to create minimum wage jobs whilst paying these companies for being here. We are getting stroked to the balls whilst are representatives are playing sectarian divide and conquer with us. I agree Connor, there is no reason for this tribal, religious politics in my mind. I am a British citizen and I am proud of my Ulster-Scots ancestry. My family heritage is strongly Scots & Presbyterian.... but i'm also a proud Ulsterman, indeed, Irishman... and I feel no contradiction in that. It seems to me that Northern Ireland's position in the UK is currently pretty secure. You of course have every right to work democratically towards a different aim. Whether i or others vote for the DUP, PUP, TUV or whomever will NOT make NI's position any more secure. I believe the only time my vote will influence NI's position within or without the Union is in the event of a constitutional referendum, should one be desired by the people. So i don't see a point in tribal politics outside of that. Our politics should be about jobs, economy, taxes, health & other services, just like most normal societies. Politicians, particularly here, thrive on fear. It's much easier to sway people into thinking that they are being oppressed and attacked than it is to convince them that maybe they are in the wrong and perhaps they may need to acknowledge their own responsibilities. So few politicians are brave enough to tell people what they don't want to hear. If the OO's planned civil disobedience turns into full-scale civil disorder in loyalist areas (and it so easily could) then the leadership of the OO & the DUP will be the first to turn their backs on these people and claim this is not what they had in mind. The loyalist areas & communities will be in tatters but of course it will be of little consequence to the high profile 'leadership' because they don't live in this area. They'll just totter off back to the more affluent suburbs and hope that the violence will pay off. Excellent pieces 69 and connor,why couldn't everyone think like this! I think it should be mandatory for everyone to spend at least 6 months outside of it in another country,the closed mindness in this wee place comes from not knowing that there is another way to live beyond bigotry and hating each other,ifnpeople coupd see that a flag or religion mean nothing elsewhere they might wise up and start licung life as it is meant to be lived! Funny enough, that was the conclusion reached by Irish American author PJ O'Rourke when he was in Belfast in the late 80's. I think the book is called 'Holidays in Hell'. I've never read such bitter vile inaccurate western propaganda about Serbs. I'm not ulster loyalist or Irish repoublican, I couldn't care less for either. who are you to write about Balkan history and compare Krajina and NI? The Balkans is full of historical disputes and to equate Serbs with loyalists is the most absurd thing I've ever heard. red, white and blue fleg loving non (anti?)-Catholics? are you out of your mind? these colours are pan-slavic colours. you will find them on Serbian, Croat, Slovak, Russian flags to name a few. as for religion, well your ignorance is quite astounding, religion in the balkans always was a tool wielded by either the austro hungarians or the ottomans. austro hungarians INVITED serbs to defend the Krajina region (as no one else was prepared to do so) against the ottoman empire in the 1500s in return for their service the Serbs were given land to live on. they were not 'planted' there as 'croatia' back then didn't exist as a state. they were under austro hungarian rule since 1102. so no Krajina Serbs whom you equate with loyalists are not the same. the idea was that if the croats could leave yugo then that is fine, they can leave. If the Serbs didn't want to live with croats, yet wanted to remain in yugo then they could do so. the yugo constitution said there was nothing wrong with independence. However unilateral independence was forbidden and would not be recognized by the constitutional court . the govt of croatia declared unilateral independence not taking the Serb wishes into consideration. your balkan history is obviously so poor you're not even able to comprehend why Serbs celebrate Kosovo. After Serbs lost in Kosovo the ottomans then occupied the country for the next 500 yrs with an iron boot, the battle was the only thing Serbs could identify with culturally, in poems, songs e.t.c it kept the Serbian spirit alive so that one day they might rid the ottomans from the country. Kosovo legend was the launch pad for Serb led rebellions against the ottomans. not to mention the Serbian monasteries dating from 6th century. Where is the loyalist 'culture or monuments' in Derry or Ireland dating from 6th century? there is none. so how can Derry be to the loyalists what Kosovo is to the Serbs? disgusting rhetoric making the Serbs out to be backward and primitive. disgraceful uneducated lies. 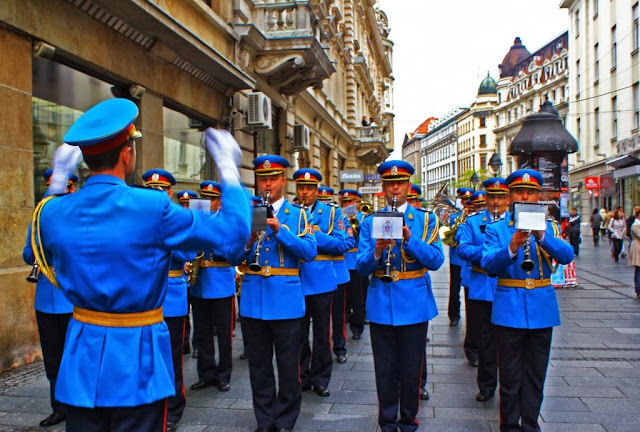 as for the Serbian military guards band being equated with 'belgrade sons of william'..what does a military guard band with a rich history have to do with men wearing sashes halfway across the world. explain that to me. there is absolutely no relationship between the two at all. so you slander us and compare us to anglo saxons halfway across the world, whose imperialism has wrought destruction on Serbia and it's people. you twist Serbian history to suit your own agenda. why do you do this? I'm amazed that someone who has never spoken to Krajina refugees nor been to Serbia, goes on the internet and drags us through the mud just so you can score points against someone you dont like. how sad and pathetic. First of all, when you judge this to be 'Western propaganda' you display a characteristic that is very recognisable to many people in Northern Ireland, the idea of 'themuns'. This comparison is just that, a comparison. I have simply cherry picked the instantly recognisable features common to both 'peoples'. It was by no means meant as a slander to any Serbs of any state. With regards to 'who am I' to write such a comparison? Well, simply put, I'm a nobody. The precedent for such a comparison has been set e.g. 'Northern Ireland: a comparative analysis by frank wright' and I am well within my rights to high light perceived similarities between two groups. e.g. The 'red, white and blue fleg loving non (anti? )-Catholics' is absolutely correct. 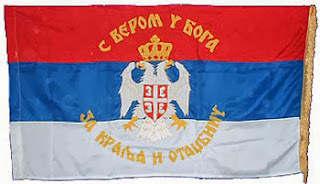 The flag of the Krajina was red, white and blue. The fact that many other Slavic countries have red, white and blue flags is utterly irrelevant. I took what was a common factor and applied to the comparison. Likewise, the Krajina Serbs were mainly non-Catholic and a small number were hostile to their Catholic neighbours. Those Catholic churches in the Krajina didn't burn themselves to the ground. So no, I'm not out of my mind (well, at least not on account of this). The common features are there for all to see. In any case, anecdotally speaking, I've had numerous conversations with Serbs who say "Serbs and Irish are alike". So your compatriots have done you a disservice on that front. I'm merely picking up the baton. I fail to see how you back up your claim of my ignorance towards religion. Your rebuttal is that religion has always been used as a tool of division in the Balkans. I would say the same of Ireland. I think you've just proven my point for me. I used the term 'planted' very loosely (hence the apostrophes). I am well aware that the Serbs were 'invited' there to man the frontier in lieu of their homelessness. The same could be argued for many lowland Scots who were 'invited' to Ulster as an alternative to facing the famine in the lowlands. So again, the comparison is valid. Not like for like, but enough to establish a frontier mentality of both groups. Also, I'm well aware that many Krajina Serbs are descended from Vlahs whose only distinction from other Vlahs was religion. 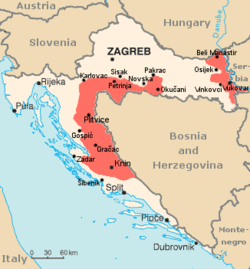 Ergo, the Orthodox Vlahs became regarded as 'Serbs' and the Catholic Vlahs came to be regarded as 'Croats'. Same applies to Northern Ireland, as a rule of thumb the Catholics are regarded as one nationality and the Protestants as 'the other'. So again, a common theme. Religion shaped 'nationality' at the expense of commonality. 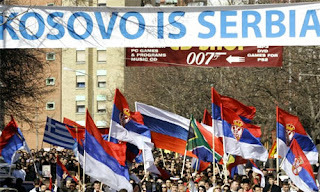 I know fine and well why Serbs celebrate Kosovo. As my friends would say "Kosovo je srce Srbije". There are no monuments from the 6th century for Irish Protestant culture. There was no such thing as Protestantism till a millennium later. Why you mention this is puzzling. Derry is simply regarded as a watershed battle and has (unfortunately) set the blue print for Protestant attitudes for centuries, i.e. "No Surrender". The reasons for cherishing either battle matter not. Kosovo is seared into the Serbian mindset and Derry is seared into the Irish Loyalist mindset. That's why I made that claim. And so far you haven't provided any evidence to suggest that it is an unfair comparison. I surmised that the Krajina Serbs were lead up the garden path by Nationalist politicians and their rhetoric and fear mongering. How can you claim that they weren't? Our politicians sabre-rattle about past battles when they want to work Protestants into a frenzy, Serbian politicians did the same. As for the 'Belgrade Sons of William' picture, will, simply put, that's Ulster humour. No one in their right mind would possibly think that I inferred that there is a mirror image culture of marching in Serbia. It was a light hearted attempt to galvanise the idea of a similarity between the two peoples. I think you have read my blog completely out of context. This could be my fault given my poor writing standards. However, the irony of it all is that your assumption that I am attacking the Serbs is very similar to the 'flegger' sense of victimhood that we see in Northern Ireland, so you have merely given me another point of comparison. Please read it again, tell me explicitly which parts are wrong and stop making assumptions about me or that I have some twisted agenda against the Serbs. I have been to Serbia numerous times, have friends in Novi Sad, Belgrade and Valjevo. I have been treated with the utmost hospitality each time I have taken the time to learn the Serbian Cyrillic script and to learn some Serbian. Most of the Serbs I know there have come from other parts of ex-Yu. They were in part refugees. Also, with regards to labelling Northern Irish people as Anglo-Saxons who wrought destruction on Serbia, well, now who is being ignorant? ruder and finn openly admitted they turned the public opinion against serbs by demonizing them. general lewis mackenzie, colonel barriot, diana johnstone all speak about the false portrayal of serbs in the media. ''Likewise, the Krajina Serbs were mainly non-Catholic and a small number were hostile to their Catholic neighbours. Those Catholic churches in the Krajina didn't burn themselves to the ground''. there were many mixed marriages in the region between croats and serbs. given the past events of WW II and the croat defense minister on video telling cro soldiers 'don not be afraid to call yourslves ustasa because you are' the Krajina Serbs wern't particularly fond of the govt in zagreb. 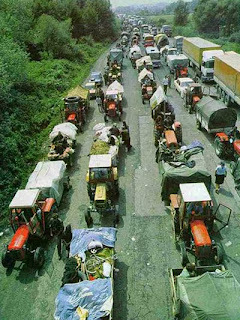 croats were not willing to allow serbs to live in croatia as much as serbs werent willing to allow croats to live in krajina. both sides destroyed the other sides's churches. that being said the videos shown at milosevic's trial where crot govt officials are on video stating knin will never again be serbian, confirmed the fears of krajina serbs. ''lowland Scots who were 'invited' to Ulster as an alternative to facing the famine in the lowlands''. after england conquered ulster? austro hungary never 'conquered' croatia. they merely became a client state. 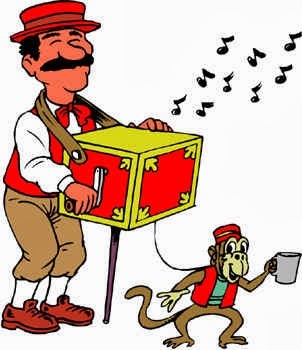 there are vlah and Serbs two different things. Serbs are south slavic and vlach are latin from romania e.t.c sure they may have migrated to the Krajina region, though they are distinguishable from serbs. what I mean about Derry is that the loyalists use the seige of Derry as an identity, yet Kosovo stretches even further back. it was the cradle of the first Serbian state knowns as raska. there were many individuals on our side who never cared for Serbs in Krajina (arkan, seselj, milosevic) they used them for their own selfish gain and when milosevic and co abandoned them they had no one. victim hood? many Serbs have a reason to not like the west as many PR firms were used to demonize and portray them as sub human. the americans and nato bombed and killed , illegally gave part of our country away, stole natural resources whilst at the same time destroying the infastructure to economically weaken the country. it's very different from the loyalist mentality..theirs is an imperial colonialist mindset that britains last outpost of occupation must be kept at all cost. by anglo saxons i meant british imperialists or loyalists. I (believe it or not) know the stuff that you're telling me. I'm certainly no academic but I'm very familiar with all that you've stated and none of it rubbishes my comparisons. Yes, there are differences, but the only people in the world who mirror the Irish Protestants and Loyalists are the Irish Protestants and Loyalists. Many Serbian nationalists didn't care about their 'fellows' in the Krajina the exact same can be said for British/Anglo-Saxon Imperialists and their fellows in Northern Ireland. No? "yet Irish and irish unionists are different in culture and genetics e.t.c"
I have much more sympathy for the Krajina Serbs than you give me credit for. I feel they were betrayed and badly led. I even have friends from places like Zadar that agree and these are people who grew up in the war. 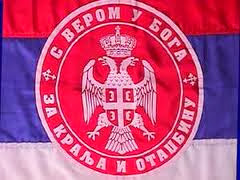 I'm not trying to demonise your people and I have a healthy respect for Serbian culture but I abhor fervent nationalism whether it be Serbian, Croatian, Irish or British. Anything that drives wedges between family and neighbours or causes them to harm others is worthy of my contempt and ridicule. With this post I was trying to illustrate the dangers of such inward looking Nationalism. Unfortunately, the Krajina Serbs were the best fit. I truly meant no disrespect to the Serbian nation and I hope that you can see this if you read it from a Northern Irish perspective. I would say a fair amount do care about Serbs in krajina, though I'm not sure what the beogradjani think. most Bosnian Serbs care about Krajina Serbs. though I'm not sure if you're trying to compare them with ulster unionists? RSK was supported by Serbia proper (minimally)though towards the end of the conflict milosevic and tudjman did a deal together as to who would get what territory and how much. well serbian nationalism just means all Serbs together in one state. the brits went to king alexander and said here draw your borders. what he should have done was make a line around areas in which serbs lived and called it serbia. but the clown created kingdom of yugoslavia. I understand. well 'brit's' havent been living outside of britain as an ''ethnic group'' they were used as pawns of imperialism by the british government. so ulster loyalists are vastly different from Krajina Srbs as the histories are different. If you study only the differences, then you will see only the differences, if you study the similarities, then you'll see the similarities. For purposes of comparison the Krajina Serbs are a good example from a Northern Irish perspective. From a Serbian point of view they may not be, but, this blog is purely Northern Irish orientated and as such that stand point takes priority. However, I will think a bit more about the Ustashe policy and how it could be applied to NI. there are many groups over the world engaged in conflict that could be 'similar to NI' wouldn't be hard to find an ethnic minority and make comparisons. 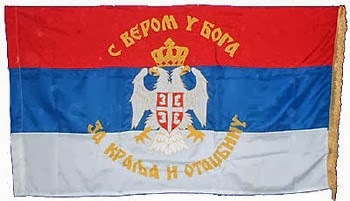 though if you looked at it from 'NI' perspective Krajina Serbs wern't keeping conquered territory for a long gone empire nor did they have an imperialistic mindset..like ulster loyalists do. only similarities I can find is both sides had paramilitary groups who went around committing war crimes. You dwell a lot on the 'imperialistic' mindset as a key difference. Surely then, given that you know that the Krajina Serbs acted as sentinels/buffers in the Krajina/frontier, then they're slightly guilty of defending an empire too? they wern't 'defending' an empire, krajina was very much a borderland, thus it was war ravaged territory that had been depopulated by the ottomans. many croats fled the ottomans to seek safety in vienna or elsewhere..
the cro parliment of the Triune kingdom recognized Srbs living in Krajina as equal or identical to the croat nation. KS wern't crazy irrational aggressors, though the croats had a hand in it as well. I know all this too, I don't understand why you keep posting more facts, it's not going to make me reconsider the comparison. If you know it then how is it you make comparisons that beneath the surface dont exist? I've always been curious about this. I know you try to make comparisons to the irish situation. why would you if you know the history of the balkans..lol I'm nt in any way trying to 'make' you reconsider' I'm just curious. Simply put, it's the comparisons on the surface that count. I found numerous similarities that could be used for reflection for types of 'nationalism' in Northern Ireland. Even with the numerous differences that you have highlighted, the Krajina Serbs have fit the bill nicely in some regards. This is not meant as a direct equivocation of 'IRISH LOYALISTS = KRAJINA SERBS' but more of a 'well, look how things panned out for these people'. It's food for thought so to speak. yeah I see, though some may equate KS directly with UL, which would be wrong. I don't know why the Bhouncer jebemville is even arguing with you, as you openly represent the chauvinistic Croatian view of the war from the 90s. I might even consider you being a Croatian, and not an Irish, as you claim. You've even said in one phrase "Ne razumem mnogo ali pokusat cu uciti vise" that represent typically a Croatian dialect, as many in Serbia would say differently this phrase. 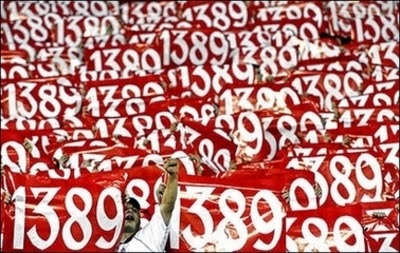 We Serbs would rather say: "Ne razumem mnogo, ali pokušaću da naučim više". Somewhere in your post you've mentioned, I'll paraphrase, that the Serbs have been expelled by the far superior Catholic Croats?! How can you than explain that the Serbian army almost reached Zagreb, the heart of Croatia. How can it be, that the Serbian army hold more than 70% of Bosnia and Hercegovina? The far superior Croatians needed the help from NATO, to be able to expel 300.000 civilians, and a small amateur Serbian army? Another utterly stupid statement of yours, is that the Serbian flag has nothing to do with a pan Slavic flag, as you could just google it out. In fact, Yugoslavian flag truly represented the pan Slavic flag, while the Serbian has the same colors, just in another order. Sometimes it's better not to have a stance on something, than to have a primitive one. First of all, I don't have a 'favourite' or a view of the war in the same way I would resent an outsider having a favourite in the Irish conflicts. I do understand the Croatian dialect much better that is true. But then curiously I'd understand the Russian Cyrillic better than Serbian Cyrillic so by your logic that must surely change the dynamic of things? Of course not, my poor understanding of Slavic languages does not reflect my view point on the wars in Ex-Yu. "that the Serbs have been expelled by the far superior Catholic Croats?! How can you than explain that the Serbian army almost reached Zagreb, the heart of Croatia. How can it be, that the Serbian army hold more than 70% of Bosnia and Hercegovina? The far superior Croatians needed the help from NATO, to be able to expel 300.000 civilians, and a small amateur Serbian army? The Croat force (with American back up) EVIDENTLY was superior in that specific region at the specific time of Storm, if it wasn't then it wouldn't have been victorious would it? I was referring SPECIFICALLY to the Krajina region during operation storm, nothing else and nowhere else and certainly WAS NOT implying a natural Catholic supremacy if that's what you were thinking (God no). I wasn't referring to any other part of the war. IT IS VERY IMPORTANT THAT YOU UNDERSTAND THIS. Random army + American military machine = superior forces. I would say that the UK has a superior force to Luxembourg, but if Luxembourg is supported by the USA then Luxembourg becomes the bigger dog in the fight, does it not?
" these colours are pan-slavic colours. you will find them on Serbian, Croat, Slovak, Russian flags to name a few." That wasn't me that wrote it, it was Bhouncer. So take it up with him/her. The fact that the flag is red white and blue is mentioned merely to strike a chord with my readers as red, white and blue flags are very much a part of political controversy in Northern Ireland, to read any deeper into this is senseless. I don't think you read all of the comments, and you certainly didn't take them in the context in which they were intended. If you look at the comments from northern Irish people you could tell that the saw my 'point' and I doubt if any of them thought any worse of the Serbian people. On the contrary they might even have some sympathy for a group of people that has been expelled from the lands they have called home for centuries, it's a fear for some people in parts of Northern Ireland's Loyalist community. So, please, calm down, read it again and read it clearly and remove from your head any idea that it's some sort of pro-Catholic, pro-Croatian propaganda, for it certainly is not, all the points that were highlighted were chosen because they have a sense of deja vu surrounding them when applied in a Northern Irish context. Do you not think I annoy enough people in Ireland without picking fights with people in the Balkans too? Thanks a bunch for sharing this with all people you actually recognize what you are talking about!Bookmarked. Kindly also discuss with my website.